One of many things that has always attracted me to this community is the tenacity that I see in maker business owners to see things through. Perseverance, gumption, ambition, flat out ballsy-ness, even! Once we latch onto an idea, we’re going to see it through come hell or high water. Sometimes these goals and dreams can seem so much bigger than our puny little insignificant selves, but by golly we’re going to give it a shot, because this is what matters to us. This is the creative business we want to build. D’Shawn Russell is one of these tenacious makers that I so admire. 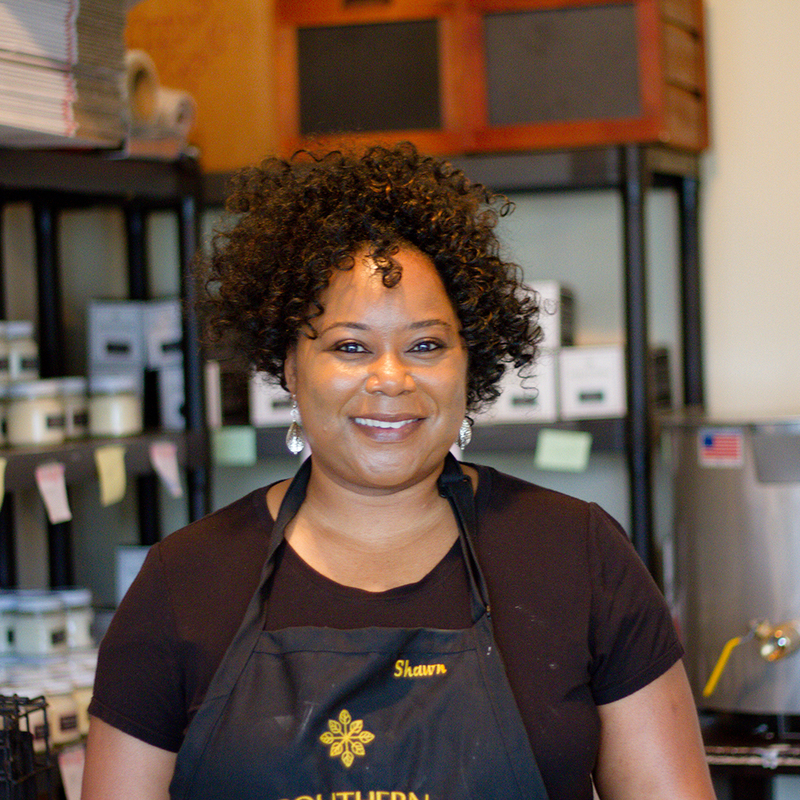 In just 2.5 years she’s gone from 0 to 200 wholesale accounts for her business, the Southern Elegance Candle Company. As you’ll hear her explain in our interview, that growth was fueled by the keen advice of a business coach and an eye single to the goal of creating a business that is sustainable and lasting. That business coach, to be more precise, is one of our personal favorites and another Southern Belle, the inimitable Lela Barker. I think you’ll love her attitude and perspective about her business, learn from her experiences, and appreciate the relatively short journey she’s traveled to be where she is today. I can’t wait to get into this in more detail, so I’ll let D’Shawn do most of the talking. Listen to the episode below! Founder and CEO, D’Shawn Russell is a true southern belle. Growing up in a small town in North Carolina, she spent summers picking homegrown fresh fruit, swimming in the ocean during the day, and catching lightning bugs at night. As an adult, she held on tight to her sacred memories of attending church all day with her grandmother and then settling in to eat a satisfying meal made with love. She began making candles that would honor the joys of southern living and provide a creative outlet for her sense of nostalgia. When she started giving them away as gifts, the response was so well received that she decided to take this newfound passion of hers and share it with more people. Thus, Southern Elegance Candle Company was born. You can learn more about D’Shawn and her work by visiting her website and following her on Instagram. From our blog: You need to be prepared when buyer’s approach you, Do’s and dont’s of wholesaling, and Wholesale for makers: A round up. In this episode, D’Shawn mentions Lela Barker of Lucky Break Consulting. Learn more about her and her services by clicking here.